The walled city of Lucca is one of the top places to go in Tuscany. In the countryside outside the walls of Lucca are vineyards, olive groves, and several villas. These stately mansions were built or remodeled by wealthy families in the 16th to 17th centuries. The villas and their surrounding gardens can be easily visited by either car or bicycle (available for rent several places inside the city walls) as day trips from Lucca. Most of the gardens charge admission and the villas can be visited on guided tours for an additional fee, arranged at the entrance. If there's no tour available in English, you will usually be given information in English so you can follow along during the visit. Note that opening times often change so use these as a rough guide. Villa Grabau, 7 kilometers north of the city in San Pancrazio, is entered through a gate with mosaics made from terracotta fragments. Believed to have originally been built in 1412, the villa was remodeled in Gothic style and finally Renaissance style by the end of the 16th century. The main hall has trompe l'oeil decoration and the villa is furnished with period pieces. It can be visited on a guided tour arranged at the ticket booth. The surrounding park is open daily (Sundays only in winter) and has a number of rare species and a box hedge theater. On the grounds of Villa Grabau are three properties that are rented out for holiday accommodation year round. 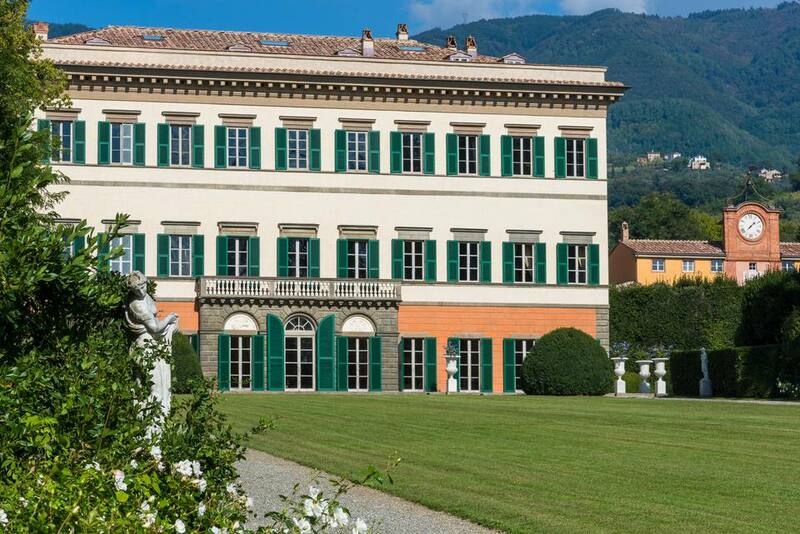 Villa Oliva, also in San Pancrazio, was built in the 15th century as the country house of a Renaissance architect. The gardens surrounding the villa haven't changed much from their original design. A cypress alley leads to the gardens that have fountains, waterfalls, a pergola, terraces, a panoramic view spot, and a display of rare plant species. Right next to the villa are the stables. The park and stables are open approximately from March through November, 9:30 - 12:30 and 2:00 - 6:00. Music events are sometimes held in August. The villa's Dependence, a large house with private pool and tennis court, can be rented for holiday accommodation. Villa Reale Park in Marlia is a large park with restored Baroque gardens, streams, a lake, and fountains. Behind the villa is a 16th-century water theater. The park is open from March through October, 10:00 - 6:00 (last entrance 5:30) and by appointment in other months. The villa itself was once owned by Napoleon's sister who created the estate by restoring a 16th-century villa and adding adjoining properties to make the large garden area. Villa Mansi is in Segromigno in Monte, a few kilometers east of Villa Reale. It was built in the 16th century but remodeled to its present form in 1634-1635. The villa's main floor is decorated with many frescoes and paintings, mostly from the 18th century. In the park are fishponds, waterfalls, statues of woodland creatures, and an English-style garden. Open April through October from 10.00 - 1.00 and 3:00 - 6:00. From November through March, closing times are 12:00 and 5:00. Closed Mondays. Ask at the entrance for the day's villa tour times. Villa Torrigiani, near Villa Mansi in Camigliano S. Gemma, is probably the most dramatic villa to visit and one of the best examples of Baroque architecture in Tuscany. In the 16th century, the villa was remodeled by Marquess Nicolao Santini, Ambassador for the Republic to the court of Louis XIV, using the Palace of Versailles as inspiration. Allegorical statues decorate the multi-colored facade. Inside trompe l’oeil frescoes and silk tapestries decorate the walls. The garden layout dates back to 1650 and includes a long row of Cypress trees, fountains, statues, and a Secret Garden. Next to the front gate is a small village originally for the servants. The villa can be visited on a tour, ask for times at the entrance. Open from first Saturday in March through the first Sunday on November, 10:00 - 12:00 and 3:00 - 5:00, longer hours in summer. Closed Tuesdays. If you have a car and want to continue in this direction, you can visit Garzoni Gardens and Pinocchio Park in the village of Collodi, where you'll also find a few restaurants. Villa Bernardini, 4 kilometers south of Lucca in Vicopelago, is one of the best-preserved villas of this area. Built in 1615, the villa is surrounded by a park with over 350 plant species, a fountain, statues, and a Secret Garden designed for the ladies. Behind the villa is a small outdoor theater. Inside are original furniture, a ceramics collection, portraits, and other art. One of the more unusual pieces is a working water clock. Open 9-12 and 3-6 on weekends and holidays by reservation. Closed at Christmas and Easter holidays and 1-6 January. You'll need a car to get to Villa Bernardini.